I want to monitor it wirelessly i.e. I want to put this device at the site and want to monitor it from any part of world. 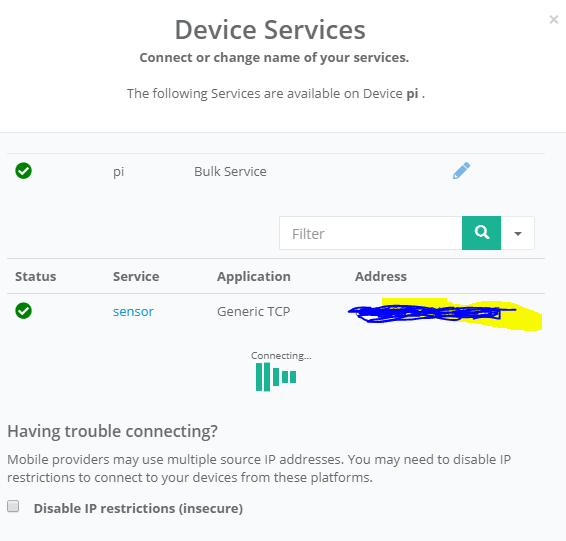 I am connecting SM135(Device) with raspberry pi and raspberry pi is having internet with help of USB mobile internet dongle. I am asking how to configure raspberry pi to act like a bridge between my laptop and the device and both connected with internet. Edit1:- Removed Wlan0 from the diagram. Edit2:- I was able to screen mirror my raspberry pi to my Laptop using remote.it service using VNC server. I can make raspberry pi a ssh,vnc server or a custom tcp server as suggested in this article https://docs.remote.it/using-the-interactive-installer/add-a-service-to-a-lan-application Is it possible to do this now? First you have to setup the 4G dongle to connect to your provider and this way you can get into the internet. You should be able to ping google.com from the RasPi. We cannot help you much with setting up the dongle because it is a specific device and not belonging to Raspberry Pi. If you have done it then you must have an interface representing the internet connection, maybe ppp0 or usb0. Bridging this interface with eth0 is not advisable for this simple task. Over the internet you can only do it using a virtual private network (VPN) with a tap interface. It is overkill and not worth the effort. So you should just use routing with different subnets for the laptop and for the sensor. The next problem is that the laptop connects through the web to the 4G dongle and it only sees the public ip address given from the provider of the dongle. This public ip address may be change from time to time usually when you establish a new connection with the RasPi. You can use a dynDNS service so you can use the same DNS name for the changing public ip address. dynDNS will always assign the right ip address to the DNS name. Or you can purchase a static public ip address from your provider. Another problem is that the 4G dongle (and any other router) uses network address translation (NAT) to connect to the internet. This is the method to translate private ip addresses, e.g. 192.168.0.0/16 to the one public ip address seen from the internet side. So you have to use so called port forwarding to find the way backwards from the one public ip address to your sensor. Maybe it isn't needed with this one to one connection but I don't know it now without details of the configuration. If needed it must be able to configure the dongle with port forwarding. You wrote in a comment that you already have access to a Graphical User Interface (GUI) on the RasPi via internet with VNC from the laptop. I assume you have MS Window$ running on the laptop and need to run a program that accesses the sensor by its ip address and on a specific port. 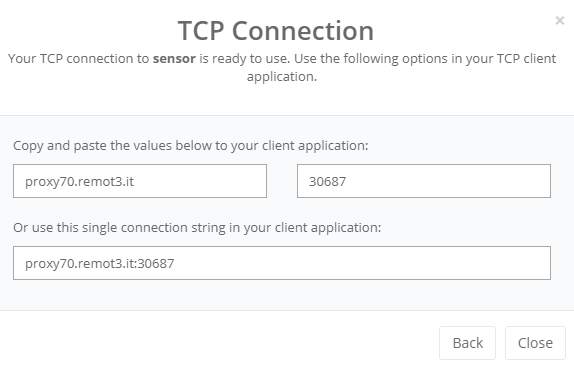 This means we have a server running on the sensor serving data to the specific port. We have a TCP connection (ip address and port) that can be routed/redirected/forwarded/bridged/whatever like any other TCP connection. This will redirect access to port 4433 on the Linux laptop to port 443 on the sensor (10.0.0.126). I don't know how to do it on MS Windows. I know it's possible but out of scope here. I suggest to setup it in two steps. First build a SSH tunnel. You should establish a Secure SHell so you can login on your remote RasPi. As far as I can see, the tool you are using, can do it. 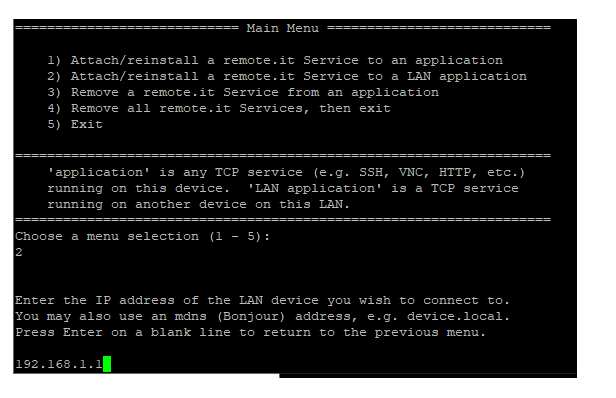 Just select "1) SSH on port 22" instead of "3) VNC on port 5900". You should be able to login to the remote RasPi to a shell with command line. If this is working then it should be no problem to make the SSH tunnel. Second: setup port redirection. To reduce possible error sources you should do it first on your local network. You already have a direct connection to the sensor as shown at your other question How to connect a ethernet device wirelessly by my laptop?. If you can access the local sensor with the monitoring tool using the ip address 127.0.0.1 or localhost and the port you have specified, then you can make the ssh tunnel and redirect to the remote sensor. remember to use :- pi# sudo wvdial instead of pi# wvdial otherwise it will give a error & also change APN to given by network operator. after all this your pi should have internet coming from usb modem. Now install remote.it in raspberry pi & configure your personal account. 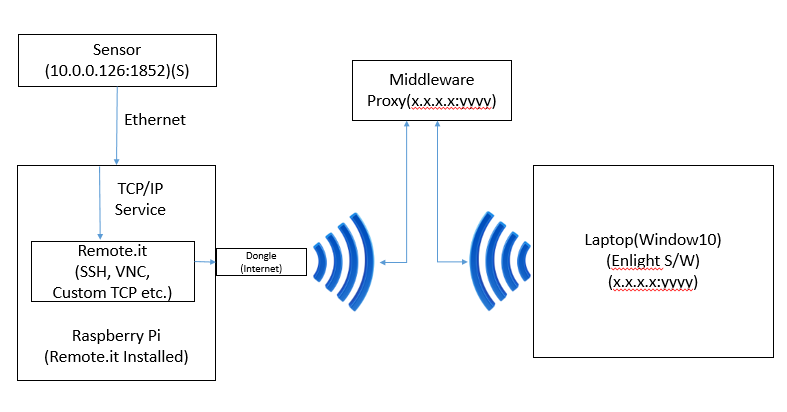 5.Now login in your remote.it web portal from anywhere in world & get your proxy address with its port this proxy is between internet & the sensor device. So now we are able to connect to any device of our tcp private network from any part of the world by using raspberry pi & dongle only. Here service provided by remote.it is groundbreaking its very innovating. P.S. : During configuring remote.it in raspberry pi be careful to write correct port. Update 1 :- system is some sort of as in below picture. Not the answer you're looking for? Browse other questions tagged networking dhcp static-ip iptables bridge or ask your own question. Why can't my Raspberry Pi get Internet access from laptop via ethernet?